Broadcom 57402 10G SFP Dual Port PCIe Adapter, Low ProfileThe Broadcom 57402 10G Low Profile Dual Port PCIe Adapter is based on Broadcom’s newest Ethernet controller technology, delivering both high performance and high efficiency for a range of applications and workloads. Broadcom NetXtreme E-series adapters help IT organizations control cost of ownership by keeping the cost of management and power to a minimum. Integrated support for Dell’s embedded management framework – integrated Dell™ Remote Access (iDRAC) with Lifecycle controller – ensures that deployment and management are as simple as possible. 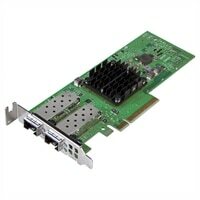 The Broadcom 57402 10G Low Profile Dual Port PCIe Adapter is based on Broadcom’s newest Ethernet controller technology, delivering both high performance and high efficiency for a range of applications and workloads. Broadcom NetXtreme E-series adapters help IT organizations control cost of ownership by keeping the cost of management and power to a minimum. Integrated support for Dell’s embedded management framework – integrated Dell™ Remote Access (iDRAC) with Lifecycle controller – ensures that deployment and management are as simple as possible.